Due to a weird psychological disorder, I just love running in the rain. Faced with a torrential downpour outside the window, even the most ardent multi-milers would recoil at the thought of pounding the pavement in that condition. Water drenching down your upper body, mud flicking up your lower body and general discomfort all over the body – these are just some of the consequences of running in the rain, and all that before you even reach the front gate of your house to begin your run! I, on the other hand, harbour a certain romantic notion about running in the rain. It began with my very first race more than 20 years ago when I was in senior high school. Despite the hellacious weather conditions for the entire 14km journey, I revelled in the mystic atmosphere where everything was hauntingly grey, and every runner was eerily silent – all I could hear was just the monotonous sound of squishing steps working in tandem with the pitter-patter of the falling rain. To cap off the experience, as I approached the finishing line from the top of a hill looking down at an ocean, the sight of the famous Bondi Beach of Sydney covered in ghostly mist just gave me the goose bumps, as well as my second (and third) wind to finish the race strongly. For some reason, the memory of that run has stayed with me all this time. And ever since I rekindled my passion for running 6 years ago, it has been added to each time I have gone out for a jog in the rain. Perhaps it is the strange ambience, or the extra solitude (I rarely see fellow joggers, let alone dog-walkers or cyclers when I run in the rain). Maybe it’s just that I’m still a kid and can’t help myself jumping in and out of muddy puddles! Whatever the reasons are, I just love running in the rain. So the next time you see a person logging the kilometres in wet conditions, don’t think he’s crazy and certainly don’t feel sorry for him. The chances are, he is probably having the time of his life! 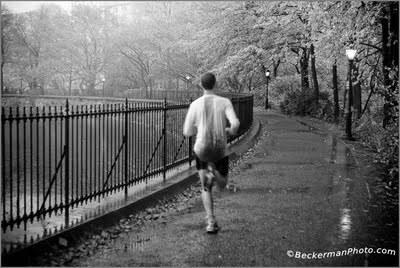 This entry was posted in Running and tagged atmosphere, rain, run on October 16, 2012 by The Jogging Dad. I share your weird psychological disorder. My favorite running weather is of the rainy kind! i would have it no other way!